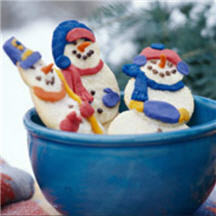 Marzipan clay makes it easy to add decorative accessories to these jolly snowmen cookies. For Marzipan Clay: Crumble almond paste in a bowl. Add the 2 tablespoons butter. Beat with an electric mixer on medium speed until combined. Add 1/2 cup of the sifted powdered sugar and syrup. Beat until combined. Shape into a ball. Knead in remaining 1/2 to 1 cup powdered sugar until mixture is firm enough to hold its shape. To tint, divide into small portions. Add enough food coloring or liquid food coloring to each portion to make desired color. If desired, wrap each portion of marzipan in plastic wrap; refrigerate up to 1 week. For Cookies: In a bowl beat the 1/3 cup butter and shortening with an electric mixer on medium to high speed 30 seconds. Add the 3/4 cup sugar and the baking powder. Beat until combined, scraping bowl. Beat in whole egg until combined. Beat in ground almonds and as much of the flour as you can with the mixer. With a wooden spoon stir in remaining flour. Divide dough in half. If necessary, cover and chill for 3 hours or until easy to handle. On a lightly floured surface roll half the dough at a time to 1/8-inch thickness. Using 2 1/2, 3, and 4-inch round cutters, cut one of each size circle for each snowman. Place a 4-inch cutout on an ungreased baking sheet. Add the 3-inch cutout and then the 2 1/2-inch cutout, overlapping the circles about 1/4 inch to form the shape of a snowman. Allow about 1 inch space between snowmen on cookie sheet. For Egg Wash: Combine egg white and 1 tablespoon water. Lightly brush egg-white mixture on cutouts; sprinkle generously with coarse or granulated sugar. If desired, use mini chocolate pieces to create eyes, mouth, and buttons. Bake 6 to 8 minutes or until edges are firm and bottoms are lightly browned. Cool on cookie sheet 1 minute. With a large spatula, carefully transfer to a cooling rack. For Icing Paste: In a small bowl combine the 1/2 cup sifted powdered sugar and 1 teaspoon water. Stir in additional water, a few drops at a time, until of a thick, drizzling consistency. Form marzipan clay into shapes for mittens, scarves and muffs; attach to cookies with the icing. Makes about 7 oversize Snowmen Cookies, each cookie big enough to split in half and share (14 servings). Nutritional Information Per Serving (1/14 of recipe): calories: 293, total fat: 16g, saturated fat: 5g, cholesterol: 31mg, sodium: 97mg, carbohydrate: 35g, fiber: 1g, protein: 4g, vitamin A: 6%, vitamin C: 0%, calcium: 5%, iron: 8%.